Although he was probably Hollywood’s most famous tough guy, James Cagney’s life story is not as well-known as that of many other legendary movie stars. 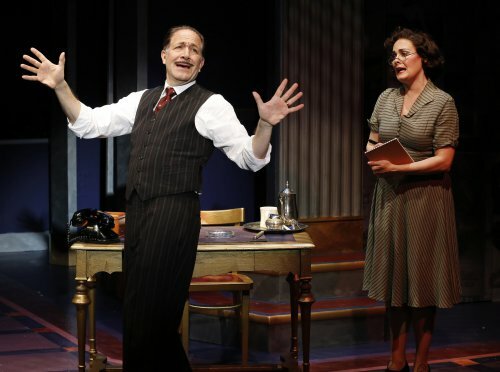 The York Theatre Company’s new musical, simply called Cagney, hopes to do something about that. Created around the obsession of actor Robert Creighton who looks a great deal like the red-headed Irish star, this entertaining show business musical also reveals the difficult times he had both on the streets of New York and at Warner Brothers in Hollywood which typecast him and wanted him to go on making the same picture over and over. Peter Colley’s book is framed by Cagney’s receiving the Screen Actors Guild Lifetime Achievement Award in 1978 and ironically introduced by his old antagonist, studio head Jack Warner. Then the musical becomes a flashback to his humble beginnings on Manhattan’s Lower East Side. When his mother nixes his plan to become a boxer which paid good money, he finds work in vaudeville (first seen in a woman’s dress), becomes a tap dancer, and later a Broadway star. We see him out in Hollywood and in recreations of iconic scenes from Public Enemy and White Heat. To all of these Cohan numbers, choreographer Joshua Bergasse has added thrilling tap dancing sequences by most of the cast, an opportunity that makes Cagney’s life a natural for being turned into a stage musical. Among songs by McGovern are the clever “Warner at Work” with his screenwriters creating roles for the star which in the second act is used as the equally clever “Cagney at Work” when the actor hires his own writers to change his image. The opening number, “Black and White,” which introduces us to the Hollywood of the 1930’s, is smartly used in the second act with new lyrics for the Dies Commission investigating so-called communist activities. 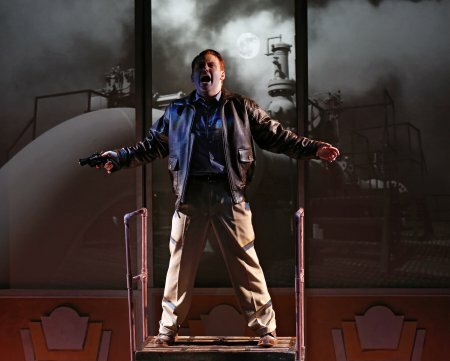 With direction by Bill Castellino and a unit set by James Morgan enhanced by projection design by Mark Pirolo, Cagney moves swiftly though it covers a great deal of ground. 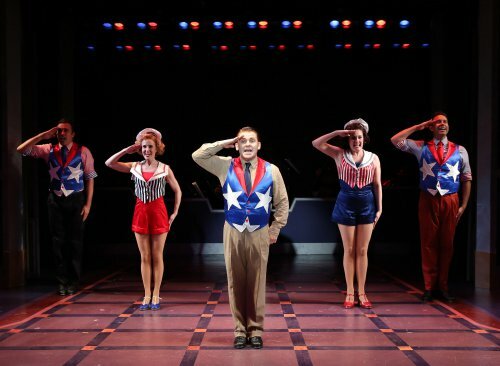 Creighton’s poignant portrayal of the star gets better and deeper as the show goes on as the character finds both his own voice and stands up for his rights in Hollywood. He is also a terrific tap dancer which stands him in good stead in this role. The rest of the cast of six plays many roles, except for Bruce Sabath who is mainly seen as studio head Jack Warner, a portrayal that makes him as interesting as Cagney himself, and a force to be reckoned with. Among the assorted roles, Ellen Zolezzi is charming as vaudeville actress “Willie” Vernon who eventually becomes Mrs. Cagney, while Danette Holden as Warner’s secretary as well as Cagney’s mother indicates she has the backbone to survive in this company. Jeremy Benton and Josh Walden play all of the other men as well as demonstrating their special tap dancing skills. The one failing of the show is that the brief portrayals of such Hollywood luminaries as Bob Hope, Bette Davis, Greta Garbo, Errol Flynn, Shirley Temple and Al Jolson aren’t convincing but with such a fast-paced evening and so small a cast, there is obviously no time for additional make-up and hair to transform them. The new musical Cagney is several things: a musical bio of the famous star, a cavalcade of period songs, and an insider view of Hollywood under the studio system. Though it doesn’t break new ground, it is an entertaining and informative show which reminds you of many beloved and iconic film moments. Keen Company’s revival of A.R. Gurney’s would-be, could-be romance between two unhappily married, middle-aged people who are reunited at a party many years after they first met on the Isle of Capri. A wild adaptation of Genet’s fierce study of class warfare set in Puerto Rico, 1941. Two males and two females perform as the pair of scheming sisters.